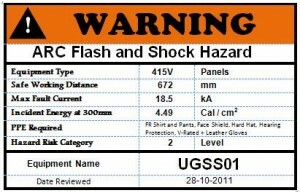 Home > News > News > Arc, Blast and Flash Injuries – Are your electrical personnel exposed to undue risk? This Standard outlines principles and procedures of safe work, organization and performance on or near low-voltage electrical installations and equipment. It provides a minimum set of procedures, safety requirements and recommendations to manage the hazards associated with electricity, specifically arc blast, arc flash, electric shock and electrocution. Adopting these will provide a safe working environment for work on or near low-voltage electrical installations. This Standard applies to all persons carrying out work on or near low-voltage electrical installations and equipment. It is the responsibility of all persons to ensure that the work they are doing does not present a risk to themselves and others at the work site or at a remote location. Persons working on or near energized conductors of electrical equipment should be aware that fault currents of up to 20 times the rated current of the supply transformer can flow for short times during arc fault conditions. ARCS THAT ARE PRODUCED UNDER THESE CONDITIONS HAVE THE ENERGY TO CAUSE AN EXPLOSION, MELT METALLIC SWITCHBOARD CUBICLES AND EQUIPMENT, CAUSE SEVERE BURNS AND FLASH BURNS TO THE FACE, EYES AND BODY AND INJURY THROUGH IMPACT FROM FLYING DEBRIS OR DISLODGED COMPONENTS. 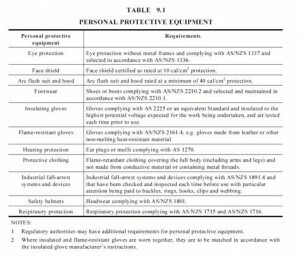 CIRCUIT PROTECTION DEVICES MIGHT NOT OPERATE TO SAFEGUARD THE WORKER IN SUCH CIRCUMSTANCES. The risk of electric shock, electrocution, arc, blast and flash burn injuries exists when performing fault-finding or testing on or near exposed energized conductors or live conductive parts. (a) Before commencing any fault-finding work on or near exposed energized conductors or live conductive parts, an assessment of the associated risks shall be made. The risk assessment shall include, but not be limited to, the determination as to whether isolation, the use of suitable barriers or a safety observer is required. NOTE: Regulatory authorities and legislation in some jurisdictions may have requirements for the use of a safety observer during fault-finding work. (b) Any persons undertaking fault-finding work on or near exposed energized conductors or live conductive parts shall be competent in the work to be carried out. (c) When fault-finding work is to be carried out on or near exposed energized conductors or live conductive parts, precautions shall be taken or procedures put into place to prevent the possibility of simultaneous contact with conductors at different voltages or to earth. Protective clothing worn by electrical workers working on or near exposed energized conductors or live conductive parts shall be appropriate for the purpose, fit correctly, cover the full body (including the arms and legs) and be in good condition while the work is being performed. Bracelets, rings, neck chains, exposed metal zips, watches and other conductive items shall not be worn while working on or near exposed energized conductors or live conductive parts. If worn, earplugs or earmuffs shall not be conductive. Given this simple drawing let’s have a look. Let’s assume an electrician is fault finding and as normal this must be completed live to undertake the measurements required for the job. The electrician is wearing standard PPE, including hard hat, glasses, cotton long sleeve shirt and pants and of course safety boots. How well is the person protected should a fault occur while they are fault finding? First of all it is clear to see that the fault level will be of a different value depending where the fault occurs. 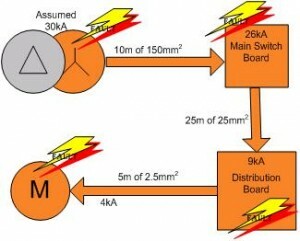 Taking the fault levels in to account let’s have a look at the Arc Flash Levels and the PPE required for each point. 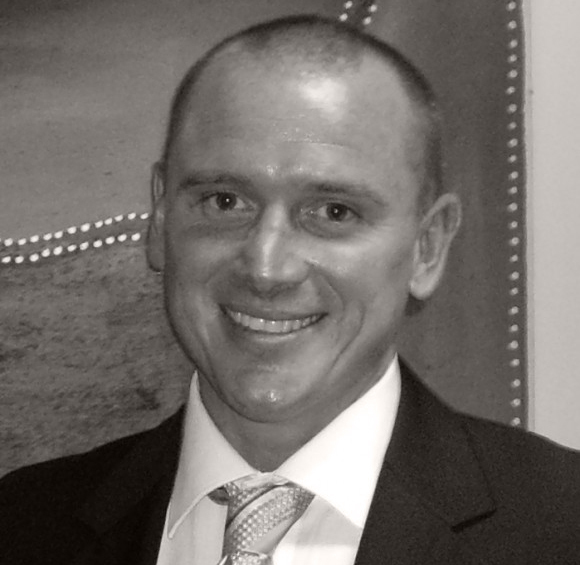 Are your electrical personnel exposed to undue risk? How James technologies can assist? We here at James technologies are fully conversant with the relevant standards, IEEE 1584 and NFPA70E. We use both standards depending on which standard is the most relevant to your installation. The first step of the process is to ensure a current single line drawing is available, up to date and complete with cable size and lengths. Also, a listing typical cell sizes on site and of course a complete list of all the protection installed and its current settings. We can of course arrange for one of experienced electrical personnel to come to site and assist with this. From this, all information is then loaded in to our software and a fault level study is produced to determine the fault levels across the installation. This also verifies if the protection settings are correct for the installation. Next step is to perform Arc-Flash-Analysis of each cell, (bucket, tray, DB, MDB,SWB, JB, JPS, or other enclosure) within the system. 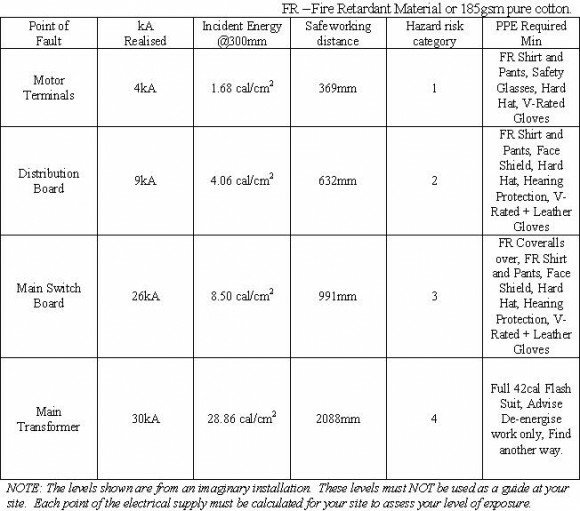 These results are tabulated and then stickers are produced to place on the cells to warn of the arc-flash hazard and the correct PPE for working within that enclosure. All of this is done with the electrical personnel on site so any engineering, administrative or PPE controls recommended, are in line with the site standards and of course achievable. 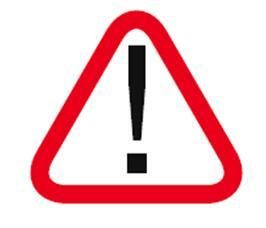 Here is a typical finished warning sticker. The Stickers can be modified to include other information, such as upstream isolation point, where fed from, etc. We do hope this has been of some interest and value to you and you company. At James technologies we have the knowledge and skills to effectively review your work practices and systems to provide a clear and concise picture of your position. We will work with your people to provide recommendations on how your business can meet it’s obligations with minimum disruption or expense. Should you require any further information, please do not hesitate to contact any of the Jamestech staff on +61-7-5547 3600 (outside Australia), or 1300 732 881(freecall within Australia).